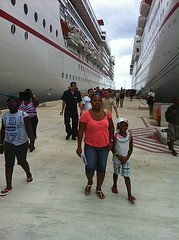 My family's first inclusive Caribbean cruise to the Ocho Rios Port was July 2011. We returned in October 2014. Both visits were truly great experiences! 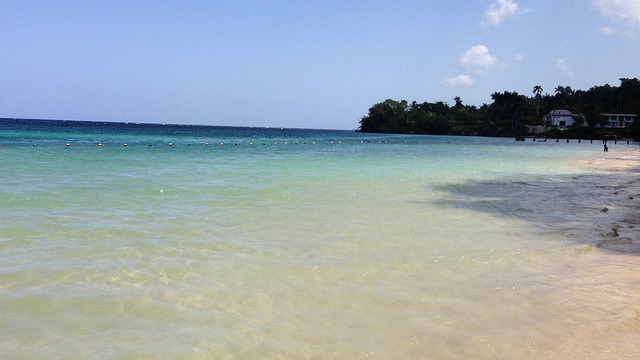 Ocho Rios is located on the northern coast of Jamaica and has long been a magnet for tourists from many countries. It is indeed one of Jamaica's hot-spots for tourism. In addition to being a great tourist magnet for travelers staying at area resorts, Ocho Rios is for cruise ship passengers. This seaport town is a chief stop for inclusive Western Caribbean cruises. Some of the top Caribbean cruise lines which offer cruises to the Ocho Rios Port are Carnival Cruise Lines, Celebrity Cruises, Holland America Cruises, Norwegian Cruise Line, Princess Cruises and Royal Caribbean International. I invite you to get your family on a cruise ship vacation bound for Ocho Rios and I guarantee that your family will have a memorable inclusive Caribbean cruise experience. One thing that I really like about the Ocho Rios Cruise Terminal is that there is a long pier which allows for ships to pull right up for debarkation. We did not have to use tenders on our two visits, as is required at some Caribbean ports of call such as Grand Cayman, another popular stop on a Western Caribbean cruise. We got off the ship and were quickly on our way to see Dunn's River Falls, one of the top attractions in Ocho Rios! Taxi or tour services are well organized at the Ocho Rios Cruise Terminal. Before you venture outside the "gate", you will find several tour buses and taxis waiting to take you to your desired destination. There is someone in charge - a dispatcher - who will get you on the next or right bus. While I am not certain how much each trip will cost, I do know that the ride to Dunn's River Falls will cost each person a fair amount for the round-trip. The bus that takes you to the Falls will bring you back to the cruise terminal. We discovered that if you venture outside the gate and book a tour bus or taxi, you will pay less for a group. On our first cruise to the Ocho Rios Port, the group of 19 people secured an air-conditioned tour bus for $200 and the trip included more than Dunn's River Falls. The driver offered to take us the Falls, to a beach, shopping and some site-seeing for only $200. Pretty cool! While the price is good, be careful to select a driver who is from a clearly established tour service. You will find someone like that. However, it is always safer to book your tour bus inside the "gate." If you choose to venture outside, get a group of fellow passengers from the ship to ride with you - if your family is small. 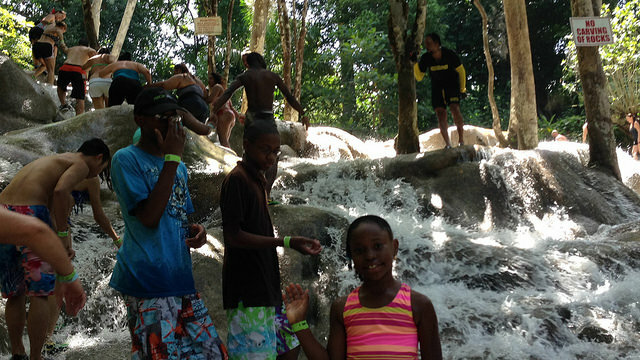 Dunn's River Falls, while major, is not the only thing to do in Ocho Rios. The Shore Excursions Desk onboard your ship offers many exciting things to do. Your family will enjoy many other shore excursions in Ocho Rios. Do you want to visit a shark close-up? Have an unforgettable experience of interacting with sharks and also enjoy the refreshing waters of Dunn's River Falls. You cannot miss out of this dream excursion - a chance to swim with a bottlenose dolphin and climb the world-renowned Dunn's River Falls. Wow! Soar through trees; swing through the Laughlands River Gorge; fly a series of long throws (as much as 600 feet long); and more. You do not want to miss this glide through the lush jungle and experience the heart of the spectacular Cranbrook Flower Forest. Have you visited an equestrian center? The Chukka Cove Equestrian Center is located between Ocho Rios and Runaway Bay. Enjoy the scenic ride to this equestrian center and get your horse. Then, enjoy your exciting horseback ride along the shoreline. So, are you ready to visit the Ocho Rios Port? There are several options of Caribbean cruise sailings to Ocho Rios, Jamaica. Let us see some Caribbean cruise lines' offerings to this top Jamaican port of call. 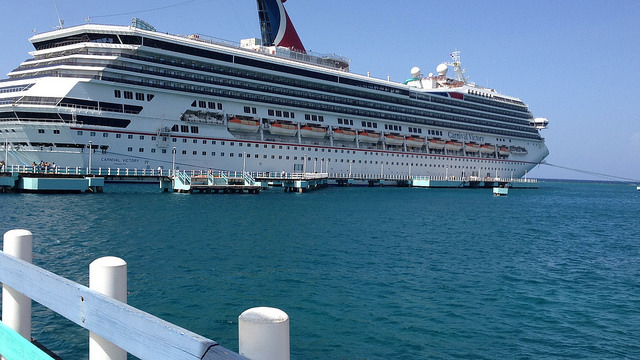 Carnival offers 5-day or longer cruises from ports like Miami to the Ocho Rios and other ports. Celebrity offers 7-day Western Caribbean cruises from Miami with stops in Ocho Rios. Find 7-day cruises from Miami with stops in Ocho Rios. Princess offers sailings from Ft. Lauderdale to Western Caribbean ports including Ocho Rios. Royal Caribbean provides itineraries from Ft. Lauderdale with calls at Ocho Rios. It was really difficult to say goodbye to Jamaica on both visits, but like all good things - our visit had come to an end. 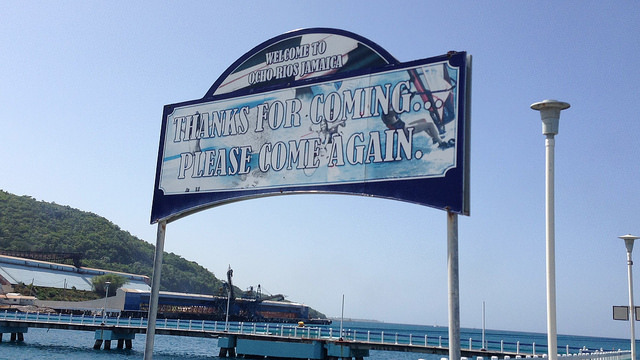 Well, I hope that you will take me up on my urging to visit Ocho Rios, Jamaica. 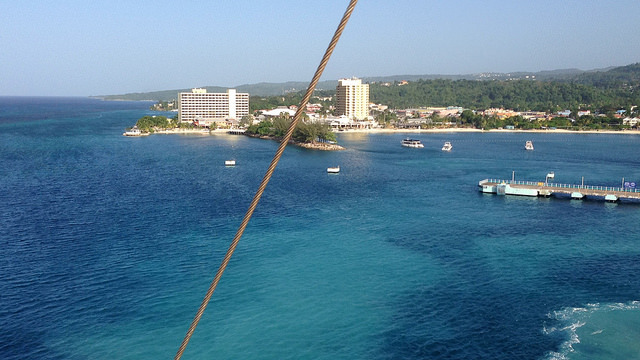 The next time you plan a Caribbean cruise, ensure that the Ocho Rios Port is included. Click here to book your family fun getaway to this port. I am confident that you and your family will have an unforgettable inclusive Caribbean cruise to Jamaica's capital cruise port - "Eight Rivers" (Ocho Rios).